Welcome to Around the World in 50 States, a new series exploring the thriving international communities that populate America through the lens of food. No matter where you are from in the world, you eat, and these communities have adapted their traditions to fit their new country. Their plates represent more than just taste preferences, but also cultural customs. Booming voices can be heard as soon as the door swings open. Groups of Somali men, some wearing the koofiyad, a traditional East African cap, and others accessorizing with bluetooth headsets are tightly packed around wooden tables. They look up only to greet and shake hands with friends who continue to arrive. It’s Saturday morning and the seating space is getting scarcer by the minute. “I come an hour drive for this action,” a man says before heading in their direction. “They’re going to flood in later.” And he’s right. As the morning turns into afternoon, the size of the groups has doubled and so has the volume of their conversations. There are no parking spots left, but there is plenty to talk about -- preferred topics include Somali clan politics and the ongoing saga of President Trump. T his is not a Somali-American cultural center that hosts an active social club, but a regular Frappuccino-blending, Pumpkin Spice Latte-slinging Starbucks. The coffee shop, located in the bustling Midwestern city of Minneapolis, is tucked between a busy highway interchange, a liberal arts college, and an apartment complex once featured as the residence of Mary Tyler Moore. No matter when you arrive at 815 25th Avenue -- whether it’s over the weekend, a Wednesday afternoon, or Friday night -- the ever-revolving group of Somali men are there, as permanent a fixture in this coffee shop as the coffee itself. 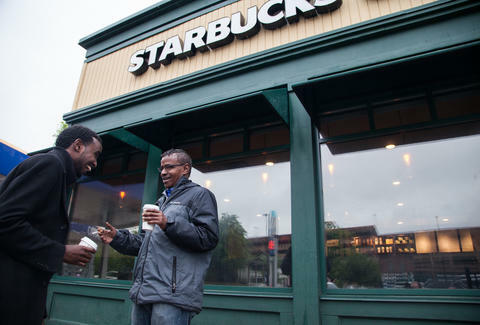 For nearly two decades, this Starbucks is where these Somali men, part of a community in transition, have dealt with the complexity of refugee identity and adjusted to the realities of life in America, over 8,000 miles away from home. Beyond the staff, there are hardly any women to be found. While younger generations can increasingly be found intermingling, traditionally, men and women rarely socialize in public together and the group here has remained traditionally segregated. "They've recreated the vibrant social scenes they left behind in the tea houses of Mogadishu." At this very coffee shop, they’ve recreated the vibrant social and cultural scenes they left behind in the tea houses of Mogadishu, where spiced chai was frequently served with a side of verbal sparring. In Somali, it’s often called “fadhi ku dirir,” translated as “fighting while sitting down." Immigrants in today’s tenser-than-normal America are often accused of rejecting assimilation and of not making enough of an effort to fit into their host country and adopt its values, unspoken rules, and cultural quirks. But this bustling intersection of Americana and Somali life not only defies that notion, it reflects a universal time honored tradition: Wherever you are in the world, having a drink and catching up with friends is an everyday part of life. And if you’re a Somali man who lives in Minneapolis and observes Islamic dietary laws (which forbid alcohol), the aptly named “Somali Starbucks” is your neighborhood caffeine-powered watering hole. It’s the place where you seek advice and catch up on gossip. “It is always full, all the time,” says Abdi, a father of four who came to the US as a refugee in 1999. He has been a regular customer at the Starbucks for around 15 years, and remembers when the coffee shop shared its parking lot with a local bagel business. “Starbucks would have customers, but they would also have empty seats,” he says. But a few years ago, the chain bought out the bagel shop and went through a redesign to accommodate its growing customer base, temporarily closing its doors and leaving Abdi and the rest of the Sitting Warriors in a kind of coffee-less social purgatory. 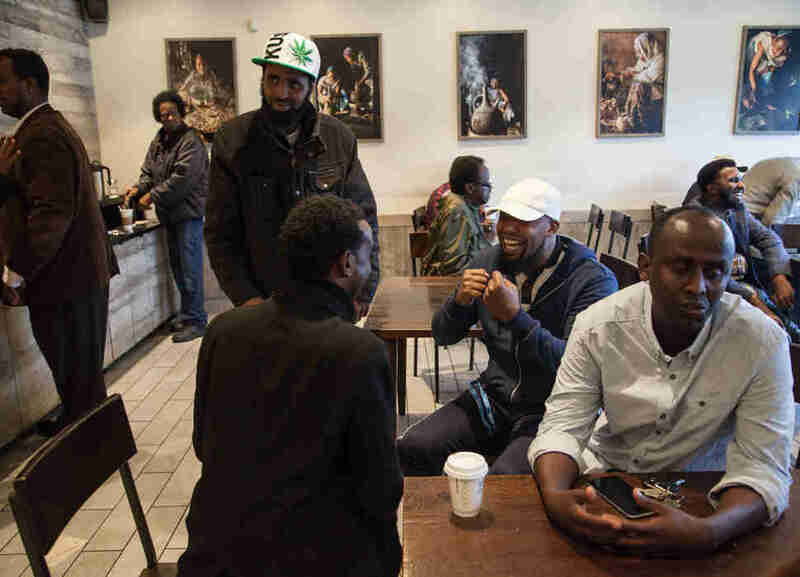 T ea -- spiced with cardamom, cloves, milk, and copious amounts of sugar -- is the drink of choice for most Somalis, so it’s surprising that an outpost of America’s most popular coffee chain became the epicenter of the community for these men. No one knows for sure how it happened, but it did even though there are many other coffee shops in Minneapolis, including Somali-owned cafes. Subsequent waves of refugees followed, who, as they were escaping violence and famine, formed a growing global Somali diaspora. Between 1990 and 2015, the total number of people who were born in Somalia but were living outside the country more than doubled, from around 850,000 to 2 million, according to the United Nations. In the US, the Somali population was 2,500 in 1990, but by 2015 it had grown to 150,000. Minneapolis quickly became a hub for the community, and soon the city had the largest Somali population in America. The Cedar-Riverside area, where the Starbucks is located, is often called Little Mogadishu. It is where Somalis have lived, worked, and socialized since resettlement, but the neighborhood has always played home to those attempting to rebuild their lives in America, from Scandinavian immigrants who built it up in the 1890s, to Korean immigrants who arrived in the 1970s. "For the Somali men who frequent the Starbucks, it's a place where they can escape from the stresses of modern life." 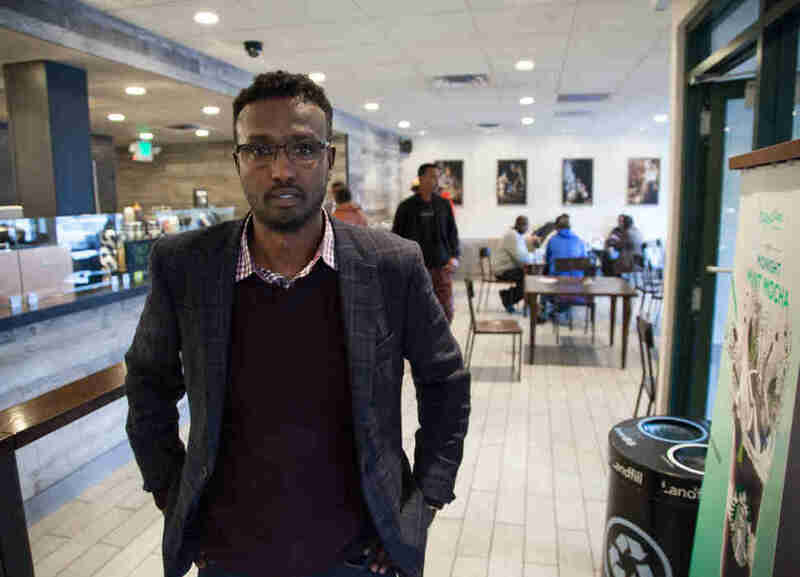 For the Somali men who frequent the Starbucks in the neighborhood, it’s a place where they can escape from the stresses of modern life and socialize, mimicking what they used to do back home, says Cawo Abdi, a sociology professor at the University of Minnesota, whose book Elusive Jannah: The Somali Diaspora and a Borderless Muslim Identity, was published last year. The Sitting Warriors have adopted their tastes to match the Starbucks menu. They order plain coffee, instead of the fragrant tea of Somalia, or chai made not with water, but extra hot milk. Starbucks, recognizing its unique customer base, has made adjustments too. Urban legend says that once a man fooled the Starbucks staff into thinking he had stolen all of their business when the Sitting Warriors disappeared for a month. Turns out, it was just Ramadan. For the last five years, however, the store has extended its hours during the holy month to accommodate customers who fast from sunup to sundown, and come in to the shop before and after Iftar, the meal eaten nightly by practicing Muslims to break their fast. For a full 30 days, the staff serve coffee and tea until midnight, waiting to see regular customers and getting to know new ones in what one barista called a “buffer zone” where there’s a mutual orientation process. “This place is for connections more than it is about coffee or anything else,” says a barista named Quoigéma. Jennifer Newcomb is a student at the nearby Augsburg College and has been working there for two years. She says the relationships she has formed with her Somali customers have changed her in an indescribable way. 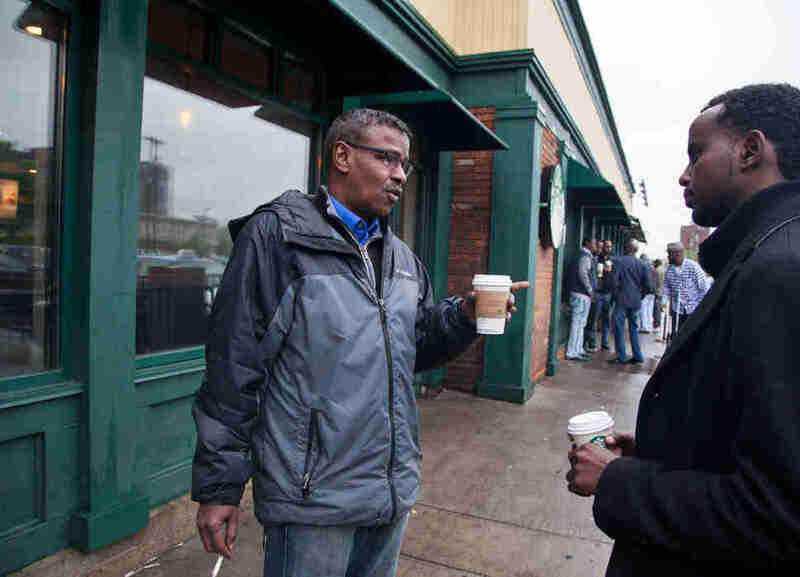 A A li Warsame is one of the regulars at the “Somali Starbucks.” Born in Somalia, Warsame was part of the initial wave of Somalis who were resettled in Minneapolis. He came to the US as a refugee in 1991 with his brothers and sisters. The first thing he remembers about being in America was how cold it was. It took it months to adjust between the heavy winter snow, which he had never seen in his life, and missing a hotter and drier Somalia. Even though he still prefers Somali tea over anything Starbucks has to offer, he became a regular after an injury turned his passion for playing sports into politics. These days, he’s known as an insightful political analyst in the group and a supporter of Somalia’s new president Mohamed Abdullahi, nicknamed “Farmajo” (as in formaggio, Italian for cheese because of his love of dairy products). Farmajo, a dual Somali-US citizen, was sworn in in February after a surprise election win that has fueled a new sense of hope for Somalis across the world. It has also become a major topic of conversation for the Sitting Warriors. Warsame, whose other interests besides politics includes penning lyrics to Somali songs, thinks that the coffee shop discussions so many Somali-American men participate in have the potential to contribute to Somalia’s potential progress. “We’re always trying to make solutions for the conflicts going on back home,” he says. But sometimes the conflicts find themselves erupting 8,000 miles away at the Starbucks, too. Somalia boasts the most homogenous society in Africa, but that categorization can be a misnomer. Based on an ancient clan system, Somali society is divided among six major tribes, with each clan controlling a portion of the country. Identity is strongly placed along clan lines. Arguments between tribal factions, as well as those with a difference of opinion, are known to break out at the Starbucks, sometimes with a side of spilled coffee. "Arguments are known to break out at the Starbucks, sometimes with a side of spilled coffee." A few weeks ago, a spat reportedly took place between two patrons, when one insulted Farmajo in front of the other. It got heated enough that one of them was asked to leave by management. But this is how diasporas are, fragmented and ever-changing, with no common cause to hold them together but remembrance of things past. The very nature of what it means to be a diaspora coupled with the complicated web of Somali clans means that the scars from the Civil War are still in the process of healing. But while the events that ravaged Somalia are permanent talking points with this crowd, so are issues closer to their adopted home. The one most commonly raised? President Trump. POTUS visited Minneapolis during his campaign and accused the Somali community of spreading “their extremist views all over our country and all over our world,” while holding a rally at the airport which employs 1,000 Somali-Americans to keep it running. The Sitting Warriors have had many conversations about Trump, about what he would do for Somalia, if anything, and how his presidency could impact them. When Trump’s proposed, but unsuccessful, travel ban included Somalia, they realized it was going to be a bumpy four years. Not helping is the community’s frayed relationship with law enforcement. The wariness and mistrust largely stems from a court case from last year, in which Abdirahman Bashir, a young Somali-American was recruited and became an FBI informant. His work for the FBI fiercely divided the community, who accused the agency of entrapment, and ultimately helped convict three Somali-American men in their 20s of trying to join ISIS. "They think they can solve Somalia's problems from far away." The case, and others like it have attracted intense media attention on Somalis in America, particularly in Minneapolis. The severe focus on the crisis, some Somali-Americans say, has led to a skewed view of the community, ignoring the strides they’ve made in not only settling into American society but also greatly contributing to it. And now, young Somali-Americans are increasingly eyeing politics in Minneapolis, instead of Mogadishu. Last year, Ilhan Omar became the country’s first Somali-American legislator. On the heels of her success, an emerging activist voice in the Minneapolis Somali community is AK Hassan, the chair of the the Somali Caucus of the Minnesota Democratic-Farmer-Labor Party who, with his disarming smile, seamlessly navigates his dual Somali-American identity. Currently running for Park Board Commissioner of Minneapolis’ 3rd district, his presence has increased Somali participation in local politics. He has found many supporters at the Starbucks, where he has helped to bridge the divide between the younger and older generations. E E ven though political uncertainty now looms within the community because of Trump’s revised travel ban -- which bars citizens of six Muslim-majority countries, including Somalia, from entering the country without a credible "bona fide relationship" with a US person or entity -- its relationship with the Starbucks continues to flourish. Recently, the coffee shop gained two Somali-American employees, one of whom arrived in the US about a year ago. They now work as a bridge between the staff and the growing Somali population. And the Sitting Warriors continue to arrive at Starbucks, whether their conversations lead to any solutions for a now-faraway homeland or not. Their presence, interspersed with caramel macchiatos and croissants, is a subtle sign that this community, despite experiencing so much flux, has found a quintessentially American place to call its own. Liana is an Armenian-American journalist from Iran currently based in Detroit. Her work often covers the intersection of immigration, identity, and diaspora in national and international publications. She once drank fermented camel milk in Mongolia and was totally OK with it. Follow her on Twitter or Instagram.